Stone lanterns at Amidagamine in Kyoto. The shrine is dedicated to Toyotomi Hideyoshi (1537-1598), Japan’s second unifier. Toyotomi Hideyoshi’s ashes were buried on Mt. 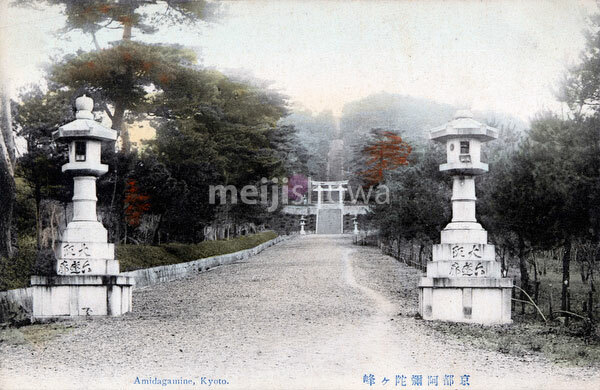 Amidagamine in 1599, and a huge shrine dedicated to him was built (Hokokubyo Mausoleum). This mausoleum was later destroyed by shogun Tokugawa Iemitsu (1604-1651). It was rebuilt during the Meiji Period (1868-1912).